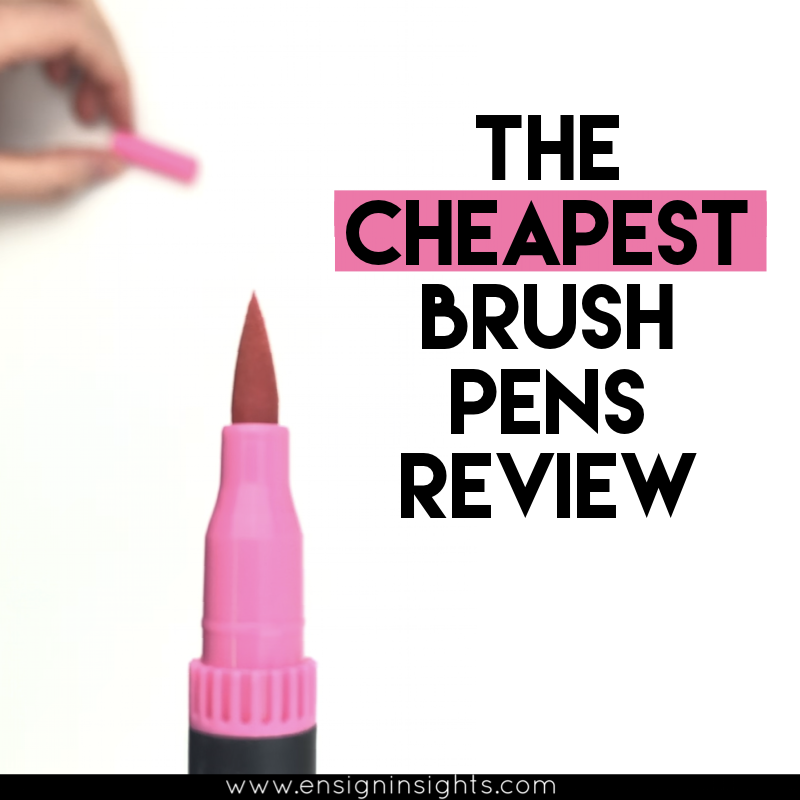 Are you looking for the most affordable and cheapest brush pens? But you also want to make sure they’re actually worth the price, even if it’s not a lot? In this brush pen review, I will show you the cheapest brush pens that I could find on Amazon. I had no idea what to expect, and to be honest, I expected very little of these cheapest brush pens. I know the brush pens that I like and even the most affordable brush pens. 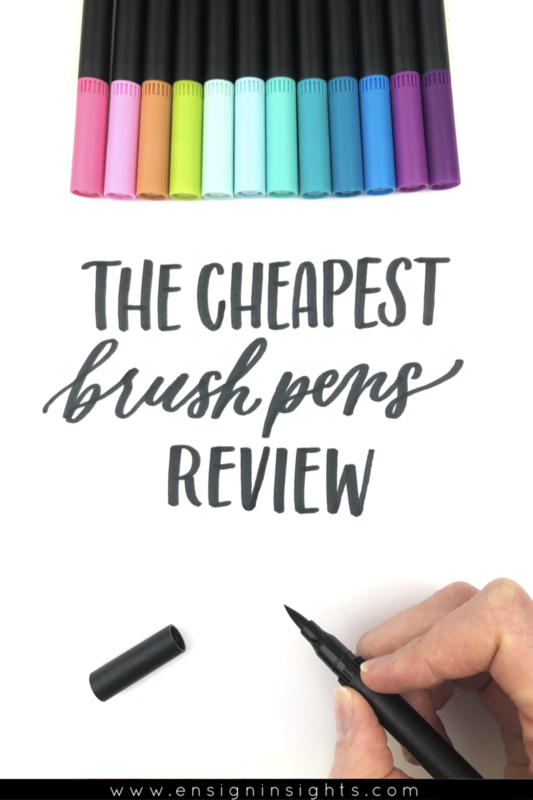 If you’re just starting hand lettering, I have shared a post about the 3 Best Brush Pens for Beginners for if you need the most basic brush pens that I recommend. They are pretty affordable brush pens as well. If you are curious about some super cheap brush pens for hand lettering, you’re in the right place. I know the best brush pens that I love and use regularly, but I’m always looking for other brush pens to try. It is super satisfying, and I hope I can help you find what brush pens fit with your hand lettering style without buying a ton of pens. With that said, I had been seeing these types of brush pens as if they’re a generic pen that different brands slap their name on. It’s the kind that that has little ridges where the cap meets the pen. I’ve been seeing them a lot and I feel like generic pens normally aren’t amazing. Although some people were creating really pretty lettering with them. With that curiosity, I had to try them myself. Would you rather watch the video review? See it here. Brush pens can get pretty expensive. Sometimes they’re worth it and sometimes they’re not. I was curious if the cheapest brush pens would be worth the money. So I went on Amazon and I found the cheapest ones I could find and here I’m going to share how well they did. These brush pens were less than $10 for a pack of 40 markers on Amazon. I know the price is always changing so these specific ones might not be the same. But I found several packs of brush markers that look like the same type with the little ridges. I’ll talk about that again a little later. I had plenty of cheap brush markers to choose from, but I went with the Crafty Clownfish brush pens (Amazon affiliate link) because they were the cheapest at the time. They also came with a zipper pouch which I thought was fun even. Although I’m not a huge orange fan and it’s bright orange. The brush nib size is very similar to Tombow Dual Brush pens. It’s not as bouncy as Tombow so it’s definitely not as good quality. The fine tip is a lot smaller than the Tombow, but I like them. I like that the fine tip is the same color as the brush tip. They are a little squeaky on the paper, but not anymore than my other brush pens. They do seem like they will easily fray. Some of the colors were already floppy and frayed. When you lift your pen after the downstroke, you want the nib to lift up easily to get that thin upstroke. I don’t know why some of the colors have a really nice bounce while others are really bad. They probably won’t last very long, but they are cheap. I didn’t love all of the colors. Of the 40 brush pens, I pulled aside about 12 colors that I really liked. They are colors I’m really excited about using, and they had a good bounce. Those colors don’t come in other brush pens very often so I liked these for that. These cheapest brush markers are not the most amazing. Although they’re not the worst. To be honest, I feel like it’s worth it just to have these colors that I don’t have in any other brush pen. I also like the fine tips. They’re not the easiest for beginners because you really have to watch the transition between upstroke and downstroke. If you want the cheapest brush pens for beginners that are great quality, I recommend classic Crayola broadline. I would say if you’re looking for a cheap way to get a huge set of colors or you like the bright colors, these cheapest brush markers aren’t a bad option. But there are better quality brush markers that I would recommend over these. If you’re interested, you can see all the different brands selling these same kind of brush markers (Amazon affiliate link). You’ll see the ridges and you can see it’s almost like a generic pen that different brands slapped their name on. So what about you? Have you tried these kinds of brush markers? Do you like them? Are you going to try them? I’m curious to hear your thoughts!